In case you missed it, the Womens March on Washington (and sister marches around the world, including the one I participated in in London) might have made some records. The coverage is still coming in and it’s amazing to see — more amazing to have participated in. You can see some my images here, but this is a story worth following and watching. To say nothing of joining in. Welcome to the Grab Back. Oh yeah, and the US has a new president who doesn’t seem to be “pivoting” from his campaign persona in any way. Shock, surprise. I watched his inauguration because I’m a citizen and think it’s important to support the process of free government. The new First Lady looked absolutely lovely, and I thought it was gracious and correct for Secretary Clinton to show up in spite of how awful I expect it felt. The speech was Orwellian, but bang on from the tone of his campaign. The next day I laced up my shoes and hit the streets to make it clear that he was not elected with a mandate and I will be supporting the issues that I care about with my time, my money, and my voice. Because again, I think it’s important to support the process of free government. This is how it works. Here are your links, kittens. Tell me what you got up to this weekend. I found this piece at Politico a very timely read. It opines that President Trump’s hostility towards the press may be a blessing in disguise. If the traditional lines of communication between the administration and the media are clipped, the press can and should (this writer argues) fan out to the myriad unofficial lines instead and take up the opportunity to do more and more extensive investigative reporting. Also, what did the administration do on Day 2? Malign the press in the face of documented facts and figures, and talk a lot about himself in his “reach out” to the CIA. An interesting piece on the physical logistics of changing over an administration. An important reminder about some of the realities of race and privilege, especially when it comes to assembly. I for one, know I can do better and I intend to. A bit more fashion levity and some street style. Love those London street style pix. I must up my game!!! 🙂 Can’t wait to hit London/Paris flea mkts and vintage shops with you. 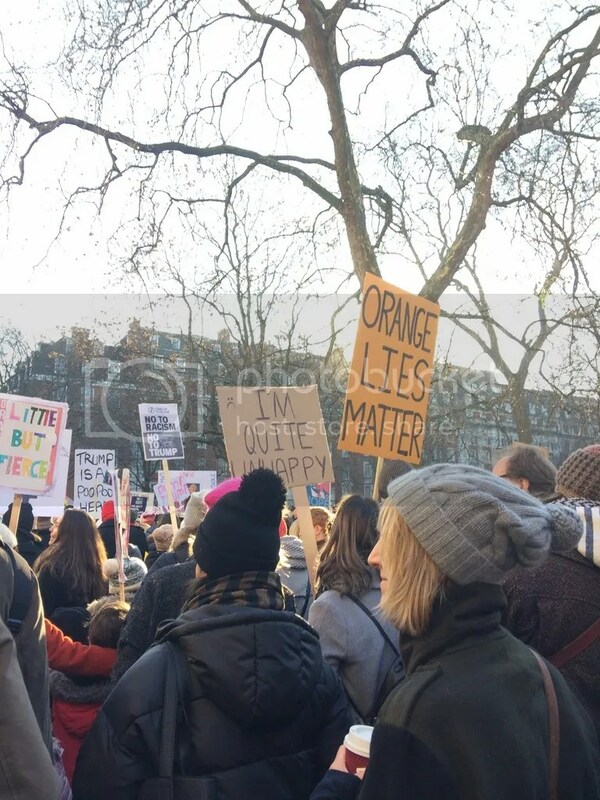 We’re so glad you participated in Women’s March London! Women’s equality and respect is the core of what we do at http://www.pocheposh.com. We make women’s fashion with pockets so you can do your daily tasks without worrying where to put your phone and keys. We are so happy to give women something all men have and make pockets an industry standard. About time right? We’re so glad you did the Women’s March London! Women’s equality and empowerment is at the core of what we do at Poche Posh http://www.pocheposh.com. We’re so excited to give women fashion in all styles with pockets so that they can get on with their daily activities. About time right?